I just got a tip from RetroGaming reader, Doom Eyes, about some nifty new toys that are availible at Toy R Us. 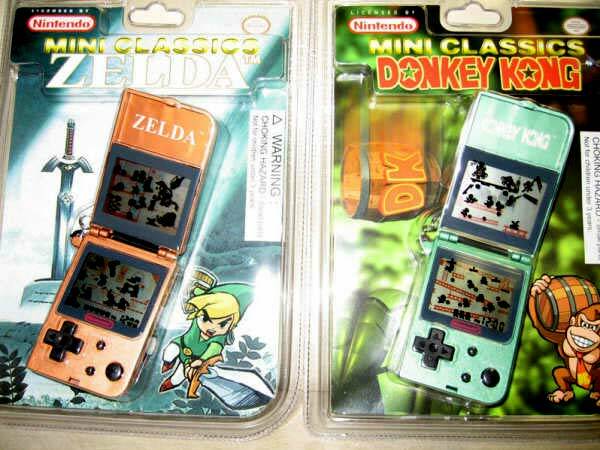 The Nintendo Mini Classics are some key-chain replicas of some of Nintendo’s old-school portable devices. 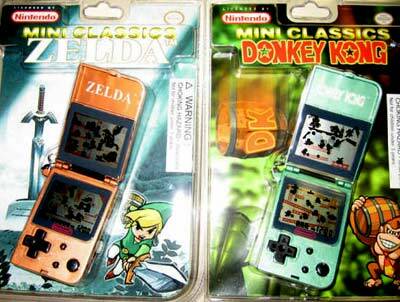 The coolest ones happen to be models of the old Zelda and Donkey Kong Game & Watch games. According to Doom Eyes, they are just like the originals in terms of gameplay and sound effects. He doesn’t have the original devices to verify, but he assures us that they play great. The graphics you see on the packaging are stickers. He also mentions that the actual graphics look better and just like the original Game & Watch. These toys retail for $10 at Toys R Us stores, but can also be snatched up on eBay and you can try watching Froogle as well. Decently priced? Ten bucks seems really steep. They’ve had these in the last several LTD catalogues for like 8 dollars eacha n passed on them then for beeing too costly. I kept hoping ot find them for closer to 5 bucks.